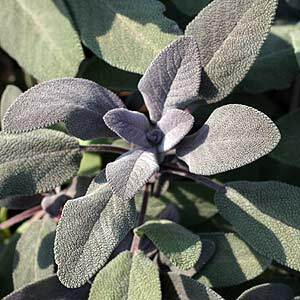 The Purple Sage is known simply as Salvia purpurea, officially we should call it Salvia officinalis ‘Purpurascens’ (syn. Salvia officinalis ‘Purpurea’), however the common name will do. This is a plant that will tolerate light shade and still produce good colored foliage. It copes well with warm climates and is generally an easy care plant. If you are looking for something a little different in the border, this could be it as it is one of the best ‘Purple Leafed’ salvias for foliage available, it also flowers.. Originally from the Mediterranean this is a wonderful low growing evergreen salvia with very attractive purple foliage, Salvia officinalis ‘Purpurescens’ (pictured right) will reach from 30cm – 50cm+. Used widely as a foliage plant, it is also a great looking plant when in flower. Flowers are purple to match the foliage tones. Fragrant foliage and drought tolerant like many salvias the new foliage is textured, opens a nice purple and turns to green. The flowers on S. officinalis ‘Purpurascens’ are a little reluctant to appear, it is the foliage that is the start of the show. Keep moist through the first summer and lightly mulch around the plant to maintain a cool root run. Height – 30 to 50 cm, sometimes taller, however better pruned to around 30 cm. Spread – Will spread to around 60 cm. Soil – Humus rich, moist and well drained..
Foliage – New foliage is purple, turning to green as it ages. Frost tolerance – Only moderate. Drought tolerance – Good to moderate. This sage is best pruned lightly and regularly rather than hard pruned. We like to keep it low as it seems to perform better when pruned.